March 27, 2016 /51 Comments/in Bias in Academia, Featured Articles /by F. Roger Devlin, Ph.D.
Dario Fernandez-Morera, of Cuban extraction, is associate professor of Spanish and Portuguese at Northwestern University. He has previously published American Academia and the Survival of Marxist Ideas (1996), as well as numerous papers on the literature of Spain’s Golden Age. 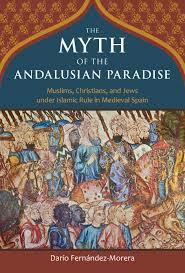 In this new book he tackles one of the anti-European left’s most cherished delusions, viz., that al-Andalus, or Moorish Spain (711–1492 AD), was a successful multicultural society in which Christians, Jews and Muslims flourished together beneath the tolerant eye of enlightened Islamic rulers. These supposed halcyon days of Moorish tolerance are contrasted favorably with both the Visigothic Kingdom that preceded them and the Spain of the inquisition that followed. the post-Roman Occident would probably have been incorporated into a cosmopolitan Muslim regnum unobstructed by borders … one devoid of a priestly caste, animated by the dogma of equality of the faithful, and respectful of all religious faiths. In two-hundred-forty pages of exposition backed up by ninety-six closely printed pages of notes, Fernandez-Morera methodically demolishes this optimistic multicultural object lesson by means of copious references to the primary documents: writings by Muslims, Christians and Jews who actually lived under Islamic rule in Spain. The cumulative effect of the evidence he cites should be enough to prove to any unbiased observer that Moorish Spain, if no worse than other Muslim-controlled societies of its time, was also no better. Spain was under Roman control and influence longer than any Western land outside of Italy and produced more Latin writers and emperors than any other Roman province. The Visigoths were the most Romanized of all the peoples that took over the Latin Roman Empire. Visigothic leaders spoke Latin and had spent generations in military and political service to Rome. In fact, Visigothic forces first entered Spain in 415 AD in order to help the Romans militarily against an invasion by less civilized Germanic tribes such as the Sueves, Alans, and Vandals. The three centuries which followed saw the gradual blending of the Roman and Germanic elements into a new Christian Hispano-Visigothic civilization. Important steps in this process included the allowance of intermarriage between Visigoths and Hispano-Romans by the laws of King Leovigild (reigned 568–586) and the conversion of his son and successor Recared from Arianism to Catholic Christianity, the religion of the native majority, in 589.
learned men such as Saint Leander (who lived in the Greek Roman Empire for a number of years and presided over the Third Toledan Council), Bishop Eugene of Toledo (expert in mathematics and astronomy), Conantius of Palencia (expert in music) and the poet-king Sisebut (who wrote an astronomical poem in Latin). Saint Isidore [Bishop of Seville] (560–636) wrote linguistic studies, natural science and cosmology treatises, biographies of biblical personages, historical works, and compendia of Greco-Roman civilization, [becoming] the most widely cited author of the European High Middle Ages. While a promising Christian Hispano-Visigothic civilization was developing in Spain, Islam was born amid the tents of largely illiterate Bedouin nomads in the Arabian peninsula. In the latter half of the seventh century, Muslim warriors overran the northern coast of Africa, destroying the Christian kingdoms that had previously existed there. In 711, a mostly Berber Muslim army under the command of Musa bin Nusayr crossed over to Spain and conquered almost the entire peninsula within ten years. all the spoil … consisting of thirty skins full of gold and silver coin, necklaces of inestimable value, pearls, rubies, topazes and emeralds, besides costly robes of all sorts; he was followed by eleven hundred prisoners, men, women, and children, of whom four hundred were princes of the royal blood. In response to the plundering, many Christians buried valuable religious art from the invaders, and archeologists still occasionally dig up such testimonies to the advanced material culture of Visigothic Spain. The Muslim invaders of 711 were numerically far inferior to the natives, and many historians have expressed surprise at their rapid success. Factors playing into their hands included the inability of the Visigoths to assemble rapidly, and the existence of a discontented royal faction willing to side with the invaders against King Roderigo. Spanish Jews, subjected by Christian Visigothic rulers to significant legal restrictions, also allied themselves with the invading army in the hope of improving their condition. For a time, they succeeded: Jews were employed guarding captured cities as the Muslims went on to new conquests, relieving the conquerors of concern for protecting their rear and allowing them to show up unexpectedly at key strategic points. Once the Muslims were firmly in control, however, Jews were reduced to a position similar to Christians. Andalusian legal texts give us an idea of what the conquest must have been like, making clear that both the burning down and the flooding of infidel towns were permissible as part of jihad. So was “cutting down their trees and their fruits, killing their animals, and destroying their buildings and everything that can be broken down.” Whether the defeated were allowed to live or were massacred was entirely up to the victorious Muslim commander; there are a number of recorded cases of outright extermination. The enemies ravaged the land, they burned the houses, they killed the men, they burned the cities, the trees, the vineyards and anything they found green they cut. So much grew this plague that there remained in Spain no good village or city … that was not burned or brought down or taken over by the Moors; and the cities they could not conquer they tricked them and conquered them with false treaties. Many modern historians seek to deny that the Muslim invasion of Spain (which they prefer to call a mere “expansion”) was religiously motivated. This view is contradicted by all medieval sources. But the contemporary academy is heavily devoted to a materialist interpretation of history derived from Marxism, and scholars of this tendency prefer to emphasize economic factors such as the quest for booty. Islam’s many academic apologists in the West have devoted a great deal of interpretive ingenuity to making out a case that the word jihad refers to something other than “Holy War against infidels,” such as “a spiritual exertion” or “interior struggle for self-perfection.” Such ideas are found in Sufi texts of a later date, but appear to have been wholly absent from medieval Andalusia: the author lists over a dozen key texts from Moorish Spain that discuss jihad exclusively in the sense of Holy War. For devout Christians, the sacred war of a Crusade was a unique event that only a pope could proclaim. For devout Muslims the sacred war of jihad was a permanent state of being decreed by Islamic law that the caliph must wage at least once a year. For more than four decades following the conquest, the victorious Berbers continued to live a primitive, nomadic life, carrying their possessions and wives about from place to place. Only in 755 did the Emir of Cordoba command them to build villages and settle down. The Arabs were coarse, without education, and not very skilled in the arts of writing and mathematics. Their nobility in particular were very unskilled because among them a lack of knowledge was their distinctive characteristic. Thus they used Jews, Christians, and freed foreigners to handle their administrative affairs. This use of Christians and Jews as administrators, motivated by practical necessity, is one of the points on which modern historians seize to justify their view of the Spanish Muslim rulers as “tolerant.” But the everyday reality for most Spanish Christians and Jews under Islamic rule was an entirely different matter. The dhimmi, standing, would present the money to the Muslim collector who would be sitting higher up on a sort of throne; this Muslim bureaucrat would hold the dhimmi by the throat telling him “Oh dhimmi, enemy of Allah, pay the jizya that you owe us for the protection and tolerance we grant you”; the other Muslims present would imitate the collector, pushing around the dhimmi. To this amusing spectacle should be admitted any Muslim who wants to enjoy it. Fernandez-Morera comments: “The dhimma system, then, was a gangster-like ‘protection racket’ that was quite profitable for the Muslim rulers.” This profitability is the main reason Spanish Muslims preferred not to make outright slaves of Christians and Jews. All sorts of other taxes could be arbitrarily piled on top of the jizya as well, in order to maintain Muslim rulers’ ostentatious lifestyle and subsidize poets, intellectuals, slaves, palaces, harems and city embellishment programs. Much Islamic law centers around the concepts of purity and impurity, and non-Muslims are considered a major source of impurity. The Maliki school of jurisprudence, which was in force for most of the period of Moorish rule in Spain, devotes much attention to the problems posed by water, garments and food touched by Christians. It was forbidden, e.g., to use the water left over by a Christian, or to use for ablutions anything a Christian has touched, or to eat food left over by a Christian. It was not considered advisable even to eat an animal a Christian had hunted. Muslim purity requirements meant that, as a practical matter, Christians and Jews had to be physically confined to their own neighborhoods much of the time, and writings from Moorish Spain contain numerous references to such separate neighborhoods. Interaction seems to have been largely confined to economic transactions. must be abhorred and shunned and should not be greeted with the formula “Peace be with you,” for the devil has gained mastery over them and has made them forget the name of God. They are the devil’s party. They must have a distinguishing sign by which they are recognized to their shame. Christians were required to stand in the presence of Muslims as a sign of respect. They were forbidden to carry weapons or to ride horses. They were normally prohibited from building new churches, and required permission even to repair existing churches. They could not convert mosques into churches, but churches could be, and often were, converted into mosques. The muezzin loudly called Muslims to prayer, but churches were forbidden to ring their bells. Christians could display crosses neither on their persons nor on the outside of their churches. Muslims could proselytize, but Christians could not. A Muslim could not only marry up to four wives but also keep as many sexual slaves as he could support. The latter did not have to be Muslim, but any children they bore had to be raised Muslim. Christian men, on the other hand, were prohibited from taking Muslim wives or concubines. All these regulations also applied, mutatis mutandis, to Jews as well. There were occasional outbreaks of resistance from the subject population, always suppressed with ruthless force. The most famous such episode was that of the Martyrs of Cordoba. In 850 AD, a monk named Perfectus was asked by some Muslims to explain what Christianity taught about Muhammad. He responded that they might not like the answer. When they persisted, he made them promise not to tell anyone. He then quoted the gospel passage in which Christ warns that “many false prophets will come in my name,” and explained that Christians consider Muhammad such a false prophet. Some days later, the same Muslims spotted Perfectus in town and pointed him out to a crowd of Muslims, saying he had insulted the Prophet. He was thrown in prison, interrogated, and eventually beheaded. The following year, a monk named Isaac went to Cordoba and declared in the presence of a Muslim judge that Muhammad was a false prophet and Islam a false religion, He was beheaded publicly and his cadaver was hung upside down at one of the city gates. These events gave birth to a movement. Within a few years, some fifty Christians publicly proclaimed their belief in Christ and the fraudulence of Muhammad’s supposed divine mission. Some were beheaded, others impaled, others flogged to death, others boiled alive. Among these martyrs were a number who had publicly converted to Islam while continuing to practice Christianity privately—the worst form of apostasy, according to Islamic law. The ruler Abd al-Rahman II responded by confiscating Christian property and taking steps to make life more difficult for all Christians. On the advice of Muslim clerics, he convened a church council in Cordoba which, under pressure, commanded Christians not to seek martyrdom. Eventually, the movement petered out. As far back as Reinhart Dozy in the nineteenth century and [Evariste] Lévi-Provençal in the early twentieth, and continuing to the present, scholars have typically described the actions of the martyrs as the foolish decisions of religious fanatics, of recalcitrant and ignorant monks and their unthinking followers. In one representative statement, a scholar called the Christian resistance the work of “an intransigent minority, not at all willing to live in peaceful convivencia and respect toward Islam.” […] The implication is clear: these people should have been grateful to the tolerant Muslim authorities. This stance would be called “blaming the victim” were the victims anyone but European Christians. Many Christians fled to the Christian kingdoms of the north (although modern historians prefer to speak of a “migration” rather than a “flight”). By 1200, there were very few Christians left in Andalusia.